Be thrilled, excited and challenged by God's unconditional, and surprising, love for His people. Hosea is a love song, with a difference. Love songs are everywhere. On the radio; on movie soundtracks; in the background as we shop and eat out. They’re often stuck in our heads and hearts, too. And yet their lyrics are full of desire leading to disappointment, and hope followed by heartbreak. Love songs reflect our yearning for a love that is solid and sure; and they expose our inability to find it. 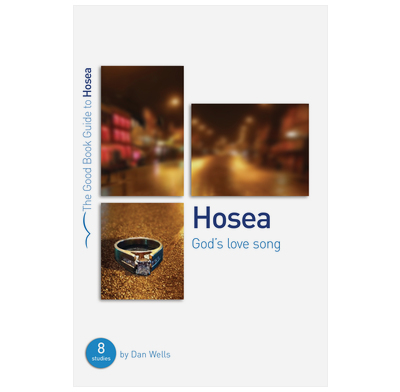 The book of Hosea is a love song. But uniquely, its lyrics are about a love which will never fade; which will never disappoint; and which will never say: “Enough”. The singer throughout Hosea is God: and the love He talks about is His own love, lavished upon His people. It’s a love song that is surprising, raw, emotional, at times uncomfortable, but always compelling. These eight studies will thrill you with the wonder of God’s love, even as they challenge you with the truth about His people. And, as you read through Hosea, you’ll be provided with a soundtrack for your life which truly is worth singing along to. This is a really useful tool to help students get into Hosea, we have used it with our international students from China and other nations. The questions push you into the text and the cross-reference passages are well chosen and illuminate the meaning. For an hours slot with internationals each study has more material than can be covered so, as with all resources. it needs running through in advance. I purchased this study guide for a friend after watching the "Amazing Love" DVD. They are working through it and find it very helpful. The format is straightforward, some questions are a little obvious, reference to other Bible passages is good and the leader's notes are helpful. We usually get a lively discussion. I really enjoyed going through this study with a group of women at my church. Hosea can be a challenging book, but when seen through Gospel lenses, the book's relevance to Christians today becomes quite clear. This was a good group study as it wasn't overly exegetical, but still thoroughly biblical and theological in nature. I appreciated the study questions with related references in the New Testament which helped us use biblical theology to understand Hosea from the other side of the cross. A very solid and thought provoking study.